The AME™ Horizontal Air Flow (HAF) Fans offer efficiency, flexibility, and simplicity. Utilizing an aerodynamic design and a high-efficiency motor, the AME™ fan is equipped to maximize the air flow potential of any situation. When combined with speed controllers, the AME™ Fans offer unmatched flexibility in air flow as plants grow and mature. Because of their shrouded, aerodynamic design and high-efficiency motor, Air Movement Efficiency (AME) fans cover greater distances with better, more even air speeds. The AME™ Fan design provides leverage for air movement. The result is not only increased forward propulsion but a pull from behind the fan as well. This helps to even air speeds by creating momentum throughout the house. The result is fewer fans needed and an increase in efficacy and reduction in electrical costs. 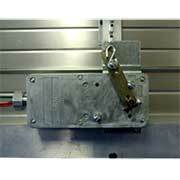 The AME Horizontal Air Flow System performs best when sized to fit a particular situation. technical personnel take into account many different variables in each greenhouse before designing a customized layout. To have a layout prepared for your greenhouse please contact your Technical Representative.